The Binghamton University Libraries provides access to a wide variety of ebooks. Certain ebook features (e.g., printing, copy/paste, offline reading, downloading to mobile devices) will vary by vendor and publisher. This guide provides instructions for finding, accessing, and using ebooks. If you have any questions, just Ask a Librarian. 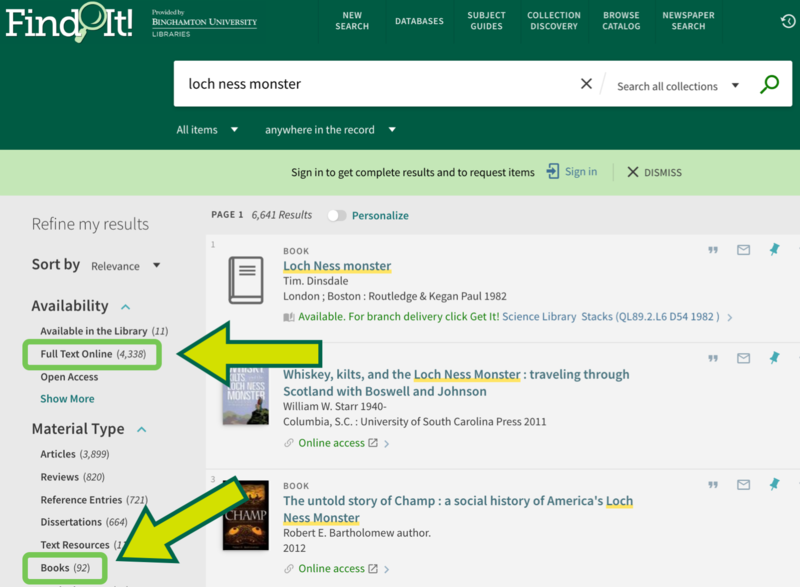 You can search for ebooks in FindIt!, specialized collections, and open access collections. When accessing these ebooks you'll need to log in with your PODS username and password. Enter your keyword(s) in Find it! and click the search button. To limit the results to ebooks, use the filters on the left - select "Full Text Online" for availability and "Books" for material type. Once you find an ebook you want to read, click the "Online access" link. At this point, you may be prompted to log in with your PODS username and password. After logging in, you will be redirected to the ebook. If the link says "# versions of this record exist. See all versions" instead of "Online access" that means the book is available as both an ebook and a print book from the Libraries. To access the ebook, click that link then click the "Online access" link on the record for the ebook. Search any of the specific ebook collections listed below. Or use the ebooks search tab to search across many major collections at once. Collection of colloquia covering biology and related sciences. Each colloquium is 50- 100-pages long and synthesizes an important research or development topic. They are authored by a prominent contributor to the field. COLLOQUIUM is an innovative information resource for research communities in the biomedical/ life sciences. It combines authoritative content with advanced digital delivery to create a resource that is substantially more useful and dynamic than traditional print and digital publications. The basic component of the library is a 50- to 120-page electronic book that synthesizes an essential scientific topic, authored by a prominent researcher in the field. It is organized by series, each managed by a prominent consulting leader in the field. The series editor oversees topic and author selection, as well as peer review to assure quality. Provides full text access to thousands of electronic books across all areas, including ebooks provided by SUNYConnect and public domain ebooks that are free to everyone. For more information on downloading and printing, see the Finding and Using Ebooks guide. You can search and browse e-books simply by following the links from our web site or, once you are at the site, you can create a free account and "check out" ebooks to view their full text. See http://libraryguides.binghamton.edu/ebooks for more information. Over 180,000 full-text books based on the English Short Title Catalogue. Includes over 33 million full-text searchable images of books, pamphlets, essays, broadsides and more published in the UK during the 18th century plus thousands from elsewhere. Although primarily in English, the database also includes many items published in other European languages. Provides extensive descriptions and holdings information for letterpress materials printed in Great Britain or any of its dependencies in any language - as well as for materials printed in English anywhere else in the world from 1473-1800. Serves as a comprehensive bibliography of the hand-press era and as a census of surviving copies. Includes materials ranging from Shakespeare and Greek New Testaments to anonymous ballads, broadsides, songs, advertisements and other ephemera. Extensive indexing includes imprint word, place, genre, and year as well as copy-specific notes. Searches may be limited by date, language and country of publication. Thousands of encyclopedias, almanacs, and specialized reference sources that can be cross-searched. Contains cumulative bibliographical information on books translated and published in about one hundred of the UNESCO Member States since 1979. Covers all disciplines: literature, social and human sciences, natural and exact sciences, art, history and so forth. The database includes 4,500 titles of ebooks on various subjects. It contains monographs of national prominent professors and dissertations and theses in fields of humanities, social sciences, natural, medical science, arts and physical educations etc. Language: Korean. Includes several thousand electronic texts and linguistic corpora, in a variety of languages. Its holdings include electronic editions of works by individual authors, standard reference works such as the Bible and mono-/bilingual dictionaries, and a range of language corpora. Features several hundred works of classical Greek and Roman authors, both in the original language and in translation (mostly older but standard editions such as the Loeb). It also includes the Latin Vulgate, the Greek New Testament, and an English Bible text. From Tufts University. Ebooks that spans subjects. For more information on downloading and printing, see the Finding and Using Ebooks guide. Must login with PODS username and password, even if on-campus. A web-based digital book collection. BU Libraries has access to selected nursing titles. Due to budget cuts, access to this resource ended on February 28, 2019. To browse a list of books we subscribe to, select My Content as a search selection. The full text of the each book including code fragments is searchable. Electronic books in computer science and engineering. The books synthesize important research or development topics. Published by Morgan & Claypool. In addition to the ebooks available from the Binghamton University Libraries, there are many open access or public domain ebooks that can be accessed via the following links. A collection of public domain documents with a focus on American and English literature and Western Philosophy. Books are searchable through a search bar or can be browsed by author, title, or tag. Online source for reference, poetry, fiction and nonfiction. Reference works contained include Bartlett’s Familiar Quotations, Gray’s Anatomy, World Factbook, and Strunk’s Elements of Style. Titles can be searched by those categories and indexes are provided by author, subject, and title. Site includes over 2,000 free classics as well as reference books, biographies, and research works. 1265 Academic peer-reviewed books from 35 publishers. Works just like web search. If the book is out of copyright, or the publisher has given Google permission, you'll be able to see a preview of the book, and in some cases the entire text. If it's in the public domain, you're free to download a PDF copy. A partnership of major research institutions and libraries working to ensure that the cultural record is preserved and accessible long into the future. There are more than sixty partners in HathiTrust, and membership is open to institutions worldwide. A multicultural, multilingual digital collection of children's literature from around the world. "The Internet Archive Text Archive contains a wide range of fiction, popular books, children's books, historical texts and academic books." Freely accessible academic books, mainly in the area of Humanities and Social Sciences, including titles from Oxford University Press and other European publishers. Books are available to read online, borrow (in eBook format), or purchase. Open Library is searchable by subject, author, or through a search bar. Classic literature titles are available for free in eBook format. An archive of public domain books available in a variety of formats including plain text, PDF, HTML and EPUB. Books can be searched by author or title. An RSS feed is available for tracking site additions. An online and offline catalog is included. Free science ebooks, textbooks, lecture notes, monographs, and other science related documents. All texts are available for free reading online, or for downloading in various formats. Contains almost 2,000 books from academic presses on a range of topics. All books are available to University of California students and staff, and over 500 titles are available to the public. Books can be browsed by author, title, or subject, or a search bar can be used. A growing library of books selected from the University of Michigan mathematics collection that have been digitized to improve access and to preserve the content of these books. All of the books in this collection were published in the 19th or early 20th century. Pittsburgh Press has made available hundreds of their out of print titles, free for download. To read, click on "Add to Bookbag," and then once viewing your bookbag, click on Download. All books download as .txt files. The full text of most ebooks can be read online on a laptop or desktop computer through the vendor-supplied platform. If you are reading an ebook online, the platform may time out. To prevent this from happening, it's recommended that you download the ebook when possible. Options for downloading vary greatly – for more details, consult the following sections of this guide. Some ebooks only allow a limited number of users to read online at the same time. If you are blocked from viewing an ebook, it's likely that someone else has the book open. Access will be allowed when they close the ebook. Some vendors require you to set up a free account in order to download ebooks. This is not an account maintained by Binghamton University Libraries or Binghamton University. Some ebooks can be downloaded as unprotected PDFs, but most will only be available as DRM-protected PDF, ACSM, or ePUB files which require external software to open. The recommended software is Adobe Digital Editions (ADE) which is free and compatible with PCs, Macs, and most e-readers and mobile devices. In order to use ADE, you will need a free Adobe account (also called an Adobe ID) which you can set up at accounts.adobe.com. ADE is not available on PODS computers or Libraries computers at this time. If the publisher permissions for an ebook include "Download Restricted", you will not be able to download the ebook. For more information on publisher permissions in Ebsco books, consult the Ebsco tab of the Printing and Copy/Pasting section below. Fill out the account information and click "Save changes"
Before downloading an ebook, you should install Adobe Digital Editions (ADE) on your computer, then authorize your computer with your Adobe ID. Open the ebook you want to download and click the "Download" button. The number of days the ebook will be available will be displayed. For some ebooks there will be a dropdown menu that you can use to adjust the number of days. Select "ePUB" for the format. Click the "Checkout & Download" button. Open the file in ADE. If the publisher permissions include "Available for Full Download", you will be able to download the ebook in full or by chapter. For more information on publisher permissions in ProQuest ebooks, consult the ProQuest Ebook Central tab of the Printing and Copy/Pasting section below. Open the ebook you want to download and click "Full Download". Select "Laptop Desktop" as the device type, and select personal or public computer, then click "Continue". Download ADE or click "Done with this step" if you have previously downloaded ADE. If available, use the dropdown menus to select the download period and format. Open the ebook you want to download and click "Chapter Download". Click "Check Out Ebook" (the loan length does not matter -- you will still be able to access the PDF after the loan expires). Click the "Chapter Download" button again. Use the dropdown menus to select your preferred citation style and the chapter to download, then click "Continue". Open the file in any PDF reader. Individual pages may be downloaded as pdf files by clicking on the "PDF" button at the top of the screen. Entire books are not available for checkout/download. Chapters of ebooks available on the Duke University Press platform can be downloaded as DRM-free PDFs. IGI Press books cannot be downloaded, but individual chapters can be saved for future use. At this time, Binghamton University users cannot download ebooks from the Safari Online platform to their computers. There are several free apps that can be used to download and read ebooks on mobile devices. The recommended app is Adobe Digital Editions (ADE) which is available for Apple devices, Android devices, and many others (see the complete list of compatible devices). In order to use ADE, you will need a free Adobe account (also called an Adobe ID) which you can set up at accounts.adobe.com. If the publisher permissions for an ebook include "Download Restricted", you will not be able to download the ebook to a mobile device. You may be able to read the ebook in your mobile device's internet browser by selecting "Full Site" at the bottom of the screen, but the interface is not optimized for mobile devices and will timeout frequently. For more information on publisher permissions in Ebsco books, consult the Ebsco tab of the Printing and Copy/Pasting section below. Fill out the account information and click "Save changes". The number of days the ebook will be available will be displayed. For some ebooks there will be a drop down menu that you can use to adjust the number of days. The ebook will download as "URLLink.acsm". Open that file in the ADE app. You may be prompted to authorize the device with your Adobe ID before you can access the ebook. The ebook will download as "URLLink.acsm". Open that file in ADE on your computer. On your mobile device, open the ADE app. The ADE app and the ADE software on your computer must be authorized with the same Adobe ID. The ebook should appear in your Library. If the ebook does not appear, try clicking "Refresh" in the app's navigation menu. In order to access an ebook from ProQuest Ebook Central on your Apple or Android mobile device, you will first need to download the full text of the ebook to your computer. Steps 1a-1e explain how to do this. 1a. On your computer, open the ebook you want to download and click "Full Download". 1b. Select "Laptop Desktop" as the device type, and select personal or public computer, then click "Continue". 1c. Download ADE or click "Done with this step" if you have previously downloaded ADE. 1d. If available, use the dropdown menus to select the download period and format. 1e. Click "Download Your Book". Open the ebook in ADE on your computer. Open the ADE app on your mobile device (the ADE app and the ADE software on your computer must be authorized with the same Adobe ID). The ebook should appear in your Library. If the ebook does not appear, try clicking "Refresh" in the app's navigation menu. 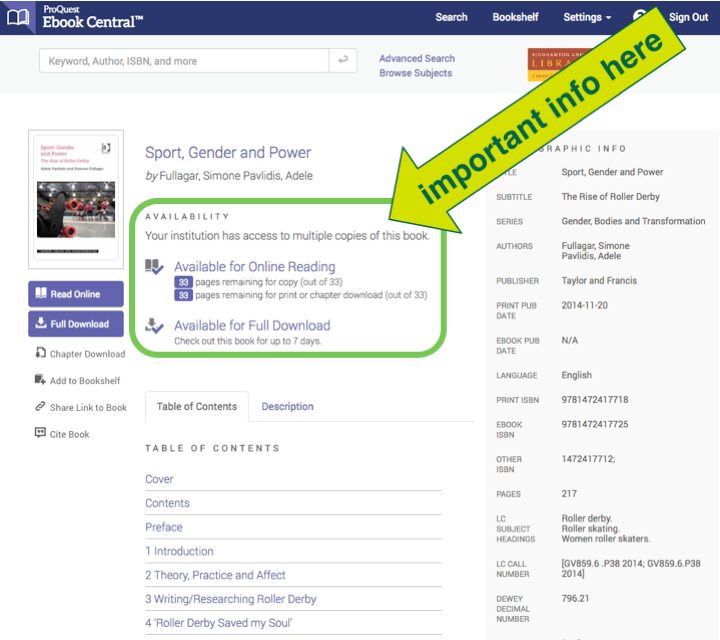 In order to access an ebook from ProQuest Ebook Central on your Nook, you will first need to download the full text of the ebook to your computer. Steps 1a-1e explain how to do this. Connect your Nook to your computer. It should appear on the "Devices" list in ADE. Drag the ebook to your Nook in the "Devices" list. When the transfer is complete, safely disconnect your Nook. ***When downloading ebooks to Kindles, ProQuest Ebook Central only allows for individual chapter downloads (full text downloads are not available at this time). 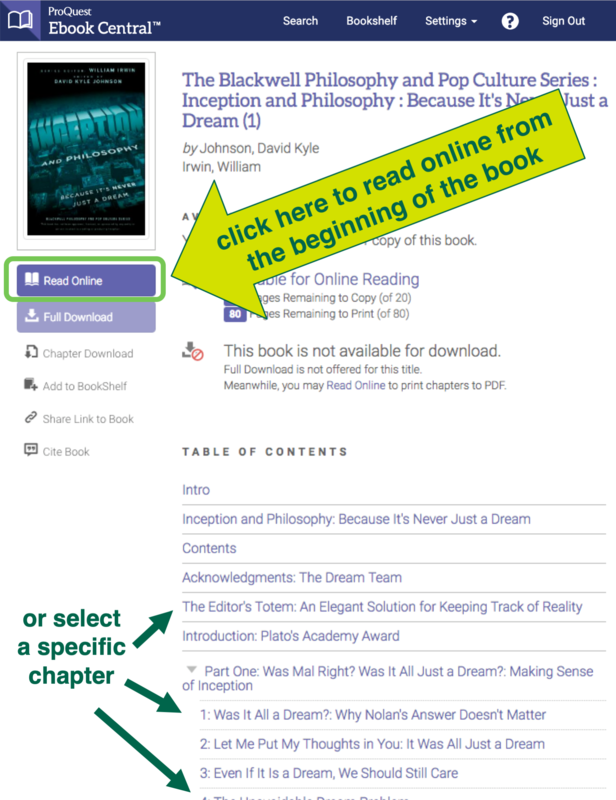 In order to access an ebook from ProQuest Ebook Central on your Kindle, you will first need to download the individual chapters of the ebook to your computer. Steps 1a-1f explain how to do this. 1a. Open the ebook you want to download and click "Chapter Download". 1b. Click "Check Out Ebook" (the loan length does not matter -- you will still be able to access the PDF after the loan expires). 1c. Click the "Chapter Download" button again. 1d. Use the dropdown menus to select your preferred citation style and the chapter to download, then click "Continue". 1f. Repeat steps 1a-1e for every chapter you want to download. Transfer the chapter PDFs to your Kindle (the process for doing this may vary depending on which type of Kindle you have -- for more assistance with this, consult Amazon's Kindle user guides). Chapters of ebooks available on the Duke University Press platform can be downloaded as DRM-free PDFs which can be accessed via mobile devices. At this time, Binghamton University users cannot download ebooks from the Safari Online platform to their mobile devices. 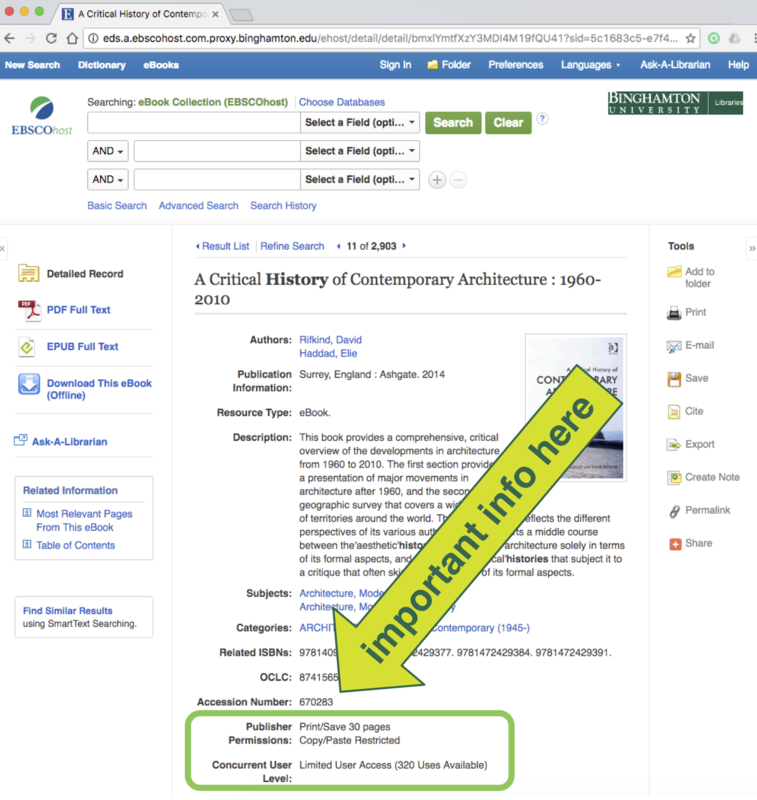 You do not need to sign in to your EbscoHost account to print or copy/paste. By clicking on the "Text" button at the top of the page and then copying/pasting selected text into a word processing program, small excerpts of text may be printed. At this time, ebooks available on the Duke University Press platform cannot be printed. Users can print HTML or PDF copies of IGI ebooks one chapter at a time. Chapters can be printed and saved by opening up the chapter of your choice and clicking on the "View PDF" link to the left of the chapter title. Quick printing and saving -- Saving and printing limited amounts of text may be available via the icons on the top left of the screen. *All options and limits will vary by title. Printing is limited to individual pages. This section provides information about the accessibility of various ebook platforms. If you have questions about a specific platform or encounter any issues related to the accessibility of ebook content, please contact Julia Glauberman at jglauber@binghamton.edu or 607-777-4808. 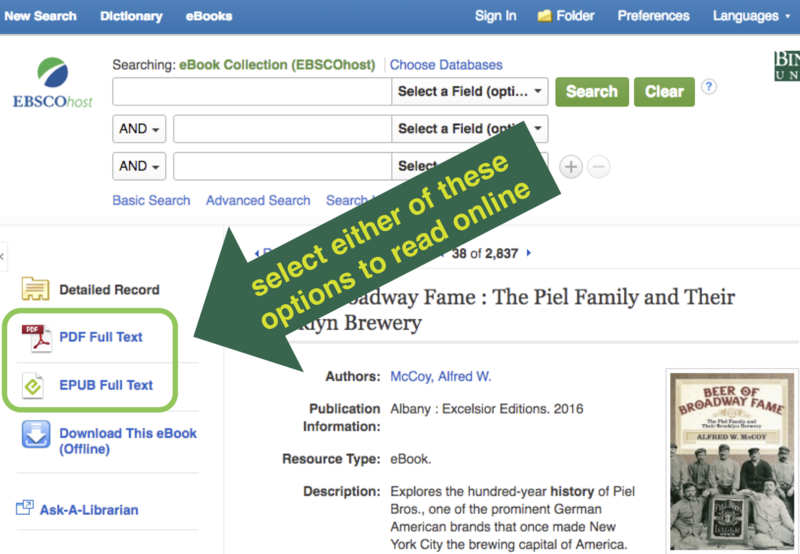 "Are EBSCO eBooks accessible? Yes: EBSCO eBooks are delivered on the EBSCOhost and EDS platforms, which are Section 508 and WCAG 2.0 Priority A compliant, and for which VPATs are available. EBSCO eBooks also follow ARIA best practices and the recommendations of the W3C Web Accessibility Initiative to make content accessible to all users. Online, for PDF format eBooks, a hidden layer to enable the delivery of ASCII text for consumption by a screenreader is available. When the ASCII text is activated, title and alt tags, as well as introductory text are properly accessible. When using a keyboard to navigate, tab order within the online eBook Viewer is maintained. Offline (downloaded) eBooks utilize Adobe Digital Editions software (ADE). ADE leverages accessibility features on Windows and Mac OS to support blind and low-vision users, such as high-contrast modes and resizing of the book’s text. ADE 2.0 also offers robust keyboard support. Screen reader users can use many different tools to read books with Digital Editions. More information about accessibility via ADE is available here: https://blogs.adobe.com/accessibility/category/digital-editions. eBooks in EPUB format are easily accessible, both online and offline, because EPUB delivers HTML text, which is consumable by screen readers and accessibility tools." Ebsco's eBooks and Accessibility FAQ page also provides answers to more detailed questions regarding specific adaptive technologies. "Are your titles accessible for people with disabilities who use assistive technology? At present we are making every effort to comply with Priority 1 of World Wide Web Consortium's (W3C) Web Content Accessibility Guidelines and some features also contribute towards compliance with Priority 2 and Priority 3 guidelines. We are also striving to ensure that this site complies with the U.S Federal Government Section 508 guidelines for Web-based information. Colors used throughout the interface have been tested against the World Wide Web Consortium's (W3C) and Hewlett Packard's standards for luminosity contrast, color difference and brightness difference. This Web site has been tested for total (monochromatic) color vision deficiency and partial color vision (Protanopia, Deuteranopia and Tritanopia). We aim to test all our products for accessibility using JAWS with Internet Explorer." EEBO's accessibility page provides more details on specific features with implications for accessibility.